Provides a 55-page status and five-year forecast through 2018 of worldwide and regional shipments and revenues covering semiconductors employed in connectivity peripherals that are used in three consumer product categories: streaming controllers, game consoles, and Set-top boxes plus Blu-ray players. The report also provides technical overviews of relevant Standards and Industry Organizations and selected products offered by companies. Targeting marketing and sales executives and product managers, the 17 business tables and accompanying MS Excel spreadsheets also include the ASP and BOM (bill of materials) of the connectivity peripherals employed in each of the segments. Provides a 40-page status and five-year forecast through 2017 of worldwide and regional shipments and revenues covering semiconductors employed in connected/smart televisions, Blu-ray players, and Set-top boxes. The report also provides technical overviews of relevant Standards and Industry Organizations and selected products offered by companies. Targeting marketing and sales executives and product managers, the 15 business tables and accompanying MS Excel spreadsheets also include the ASP and BOM (bill of materials) of the connectivity components employed in each of the segments. Encore Info's 55-page "Connected Television Peripheral Semiconductor Forecast 2012-2018" analysis provides status and five-year forecast of worldwide and regional shipments and revenues covering semiconductors employed in connectivity peripherals that are used in three consumer product categories: streaming controllers, game consoles, and Set-top boxes plus Blu-ray players. The report also provides technical overviews of relevant Standards and Industry Organizations and selected products offered by companies (see included ToC). Targeting marketing and sales executives and product managers, the 17 business tables and accompanying MS Excel spreadsheets also include the ASP and BOM (bill of materials) of the connectivity peripherals employed in each of the segments. Researched and written by hardware/software—experienced technical journalist and principal analyst Robert Cravotta, the report is based on available data and meetings with relevant companies as well as technical background provided by Encore Info's experienced team. The report corporate price is $2495 and the electronic version includes the MS Excel spreadsheet plus 2 hours of answered questions by the analyst. Download the report brochure. Santa Clarita, California, November 2013 – Encore Info has announced the availability of its new worldwide market research report for the semiconductor components that provide the connectivity and processing performance for connected TVs peripherals. The report covers cost and worldwide shipments of streaming controllers (systems solely dedicated to connectivity), game consoles, Blu-ray players, and set-top boxes. The research report “Connected TV Peripherals Semiconductor Forecast 2012-2018” is a new study of the global and regional shipments of peripherals that can add, track, and upgrade network connectivity and application processing to TVs. 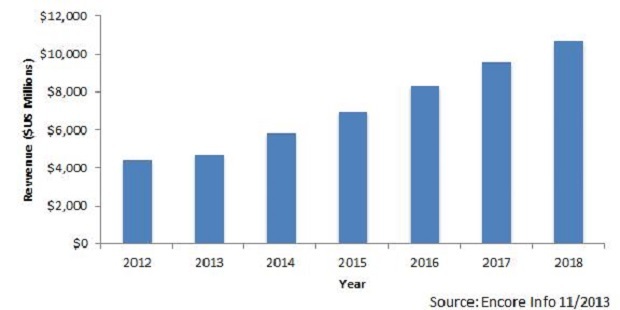 By 2018, Encore Info forecasts that the global market for semiconductor components providing the connectivity and application support in connected TV peripherals will reach over 10.6 Billion US Dollars. “A profound shift in business is taking place with Set-tops and paid-for DVD rental services in one corner defending themselves and in the other corner, the less expensive and free-of-charge Internet entertainment offerings that find increasing numbers of followers” said Encore Info principal analyst Robert Cravotta, “the result is the quick evolution we see in connected TV peripheral market, making it an opportunity for OEMs that design peripherals and companies that provide the SoCs and modules necessary for wirelessly accessing online entertainment, games, Apps, and Internet sites by consumer televisions” Cravotta explained. The 55-page “Connected Television Peripherals Semiconductor Forecast 2012-2018” and accompanying spreadsheets are available electronically through Encore Info for the price of $1995. The report covers worldwide and regional analysis and forecast of revenue and shipments for connectivity semiconductors contained in three segments of connected television peripherals. The included 17 tables also cover ASP and BOM (bill of materials) of the connectivity semiconductors used in each of these segments. Additional details about the report are available at www.encoreinfo.com/reports/eictvp1311. © Copyright 2013 Encore Info Inc. All rights reserved.